Johnny grinned. "Listen!" said Johnny. Peter listened. From a tree just a little way off came a clear "Chip, chip, chip, chip." Peter didn't need to be told to look. He knew without looking who was over there. He knew that voice for that of one of his oldest and best friends in the Old Orchard, a little fellow with a red-brown cap, brown back with feathers streaked with black, brownish wings and tail, a gray waistcoat and black bill, and a little white line over each eye—altogether as trim a little gentleman as Peter was acquainted with. It was Chippy, as everybody calls the Chipping Sparrow, the smallest of the family. "What's that?" Peter's voice sounded as if he suspected that Johnny Chuck was trying to fool him. "It isn't hair from the coat of a horse that we want," cried Chippy, as he prepared to fly after Mrs. Chippy. "It is long hair from the tail or mane of a horse that we must have. It makes the very nicest kind of lining for a nest." Chippy and Mrs. Chippy were gone a long time, but when they did return each was carrying a long black hair. They had found what they wanted, and Mrs. Chippy was in high spirits because, as she took pains to explain to Peter, that little nest would now soon be ready for the four beautiful little blue eggs with black spots on one end she meant to lay in it. Johnny Chuck looked as if he doubted that. "I never heard of him," he grunted. The Reddish-brown cap and dark spot in the middle of his breast are all you need to look for. 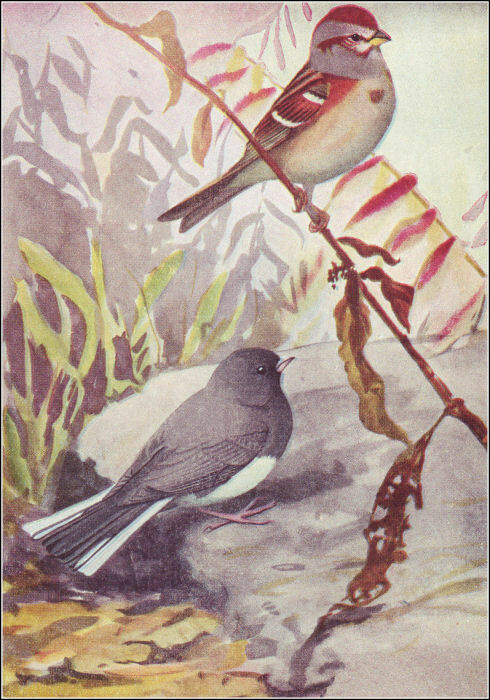 The little slate-colored and white ground bird of winter.